 Measurements should be repeatable, but since every laboratory has its own practices, instruments, and devices, the results of two repetitions of the same experiment are not always the same even though the same protocol is used. In this year’s InterLab study, iGEM teams transformed Escherichia coli DH5α with different plasmids expressing Green Fluorescent Protein (GFP) and a plate reader was used to measure absorbance and fluorescence values from the transformed strains. The results submitted by each team will be analyzed by the iGEM Measurement Committee, with the aim of evaluating the variability in measurements among different labs. The final goal would be to standardize the measuring procedures and increase their reproducibility. The results obtained by our team are presented on this page. For all the steps, we used protocols provided by iGEM and did not encounter significant problems with them. The DH5α cells were made competent by using the iGEM Competent Cells protocol1. LB was used as a medium instead of SOB or SOC, which may have affected the transformation efficiency. Cell competency was measured by using the Competent Cell Test Kit provided by iGEM. The kit contained two vials of purified plasmid DNA from BBa_J04450 in plasmid backbone pSB1C3. The plasmid concentrations in the vials were 10 pg/µl and 100 pg/µl. Measurements were done according to the iGEM Competent Cell Test Kit protocol2. According to the iGEM Competent Cell Test Kit protocol2, competent cells should have an efficiency of 1.5 ⋅ 108 to 6 ⋅ 108 cfu/µg. The calculated transformation efficiency was 6.6 ⋅ 105 cfu/µg, which is very low compared to that. However, the transformations were still successful. The transformation of E. Coli DH5α was performed with eight different plasmids. The test device plasmids contained GFP that had small structural differences, e.g. different promoters. Because the plate reader measures absorbance that depends on volume, it was necessary to measure the ratio of OD600 to Abs600. LUDOX CL-X and sterile water were used in the experiment according to the iGEM InterLab Plate Reader Protocol4. 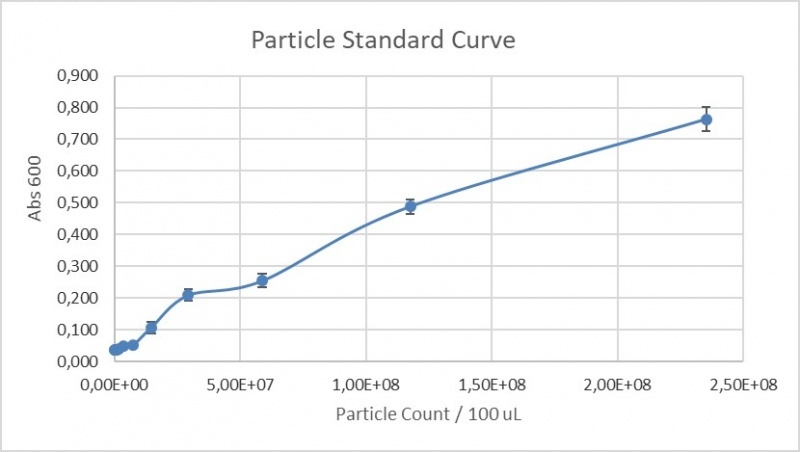 LUDOX CL-X is a 45 % colloidal silica suspension. Table 4 shows the results. 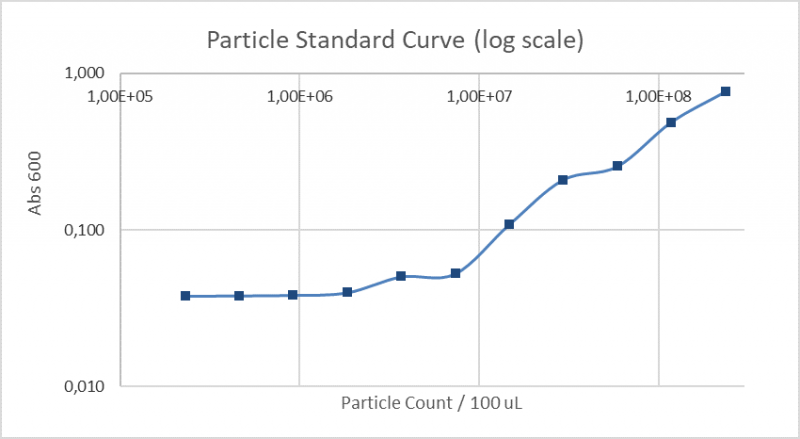 A microsphere suspension was used to construct the particle standard curve. The microspheres are the same scale as the cells and the optical properties are also similar to the cells that were used. A dilution series of the microspheres was made in order to obtain the relation between absorbance and the number of cells. This was done according to the iGEM InterLab Plate Reader Protocol4. 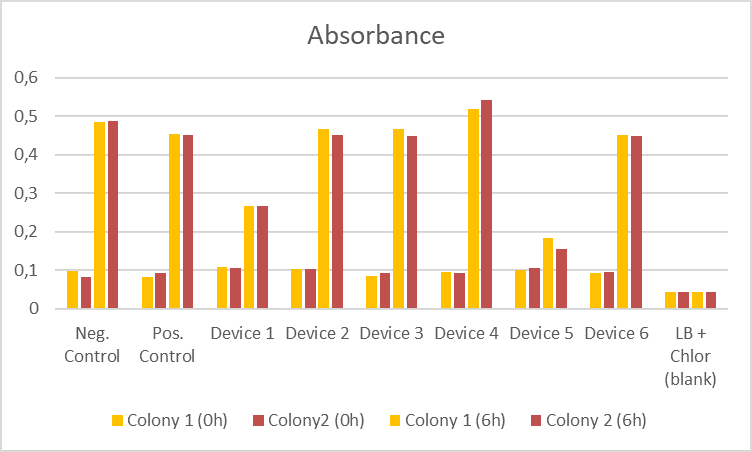 The results were used to estimate the numbers of cells in certain absorbances. The standard curves are shown in figures 1 and 2. 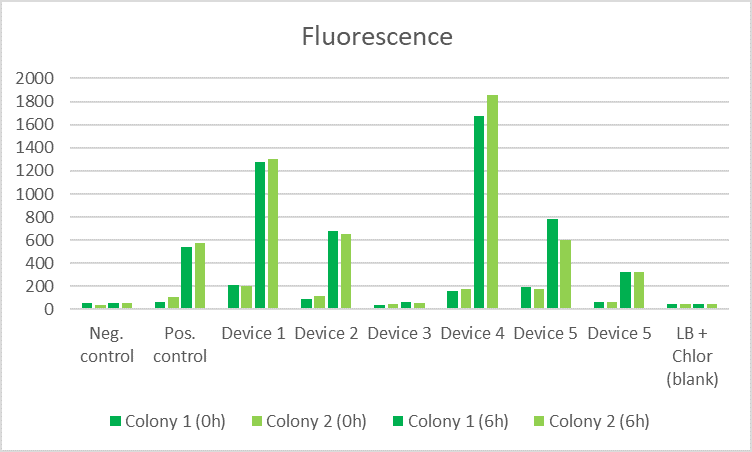 The fluorescence values vary depending on the device and because the measured values are relative, depending on the measuring parameters used. 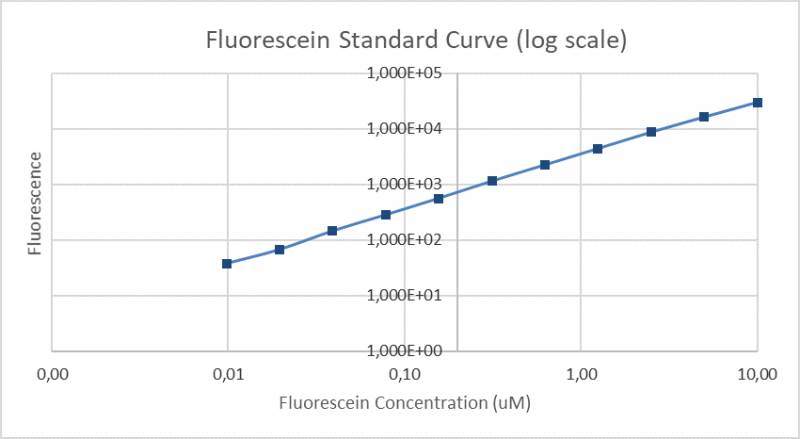 Fluorescence standard curves make it possible to compare the fluorescence measurements between teams. 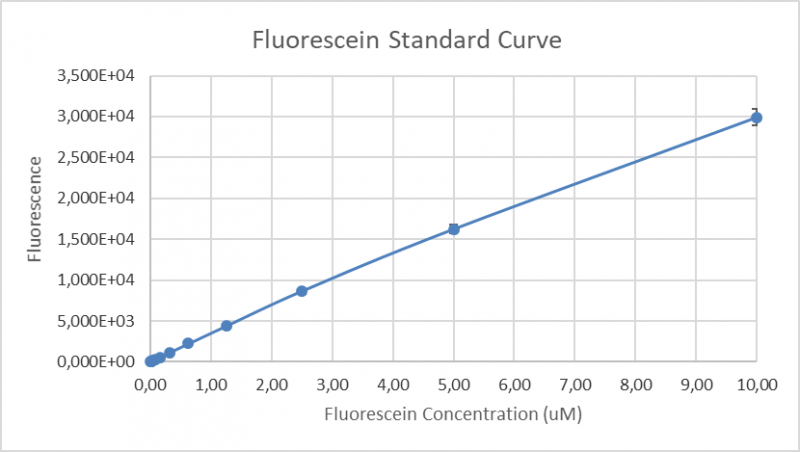 Fluorescein was serially diluted in phosphate buffered saline in order to get different fluorescein concentrations. Finally, fluorescence was measured by using a plate reader. The experiment was done according to the iGEM InterLab Plate Reader Protocol4. The standard curves are shown in figures 3 and 4. Transformation was done according to the iGEM Transformation protocol3. After that, two colonies were picked from each plate and inoculated in LB medium, which contained chloramphenicol. The cells were incubated overnight after which they were diluted to 0.02 abs600. Samples were taken at 0h and 6h from the diluted cultures. The cells were incubated at 37 °C, 220 rpm between the time points. The iGEM InterLab Plate Reader Protocol4 has a more detailed description about the process. Dilution series was performed to estimate the amount of bacteria in culture. iGEM protocol4 assumed that one bacterial forms one colony. Dilutions 3-5 were plated, and colonies were counted after 18 hours incubation. The results were multiplied by dilution factor. The mean was 13.042 ⋅ 105 CFU/mL in 0.1 OD600.